To order or to enquire about distribution, please kindly email >>us<<. Thank you. 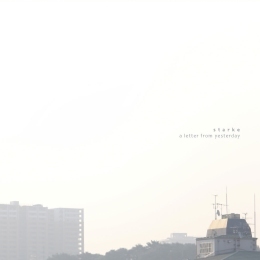 text := Arriving with the warmth and brightness of the rain showers of summer, "A Letter From Yesterday", the debut album by Starke, is altogether a document of that inner peacefulness, the encircling captivation of the undisturbed, and pleasant moments of everyday. Consisting of members Shunichiro Fujimoto, known for his glistening, acoustic-ambient magnificence as Fjordne, and Yushi Mori, renowned as an extremely talented and unique visionary of percussion, through bands such as ミーティア気象台 (Meteor Kishodai), Å, and Under Groove, the two artists have come together to produce an astounding work displaying tenderness, the understanding of reflection, in a comforting melody of those peaceful moments of yesterdays. Originally created by the duo as an escape to the gloomy weekends of bad weather, secluded inside homes, Starke have created not only warmth from this solitude, but a presence of something more welcoming, of the existence of a softhearted surrounding, soaking with that imagination of wishing, of those experiences we all hope for. Field recordings and found sounds add dashes of realism into acoustic environments as they transform into moving moments, kept close, while drum rhythms swell in soft anthems of lightness, and exploration. Such is the upswing of these passing emotions, given even more consistent beauty through the beautifully-lended vocals of Fuyu, allowing everything its own place, and trace in tranquility. Displaying an endearing spirit throughout the albums' existence, "A Letter From Yesterday" touches the moments of these endless days, whether staying in the comfort of a home, or entering the outside world. Upon visiting the outside again, after a rain, everything feels so much different, with sparkling rejuvenation, and a promising hope of the beauty for the future. Further bathed in pianos, whirls of strings and dotted with processed, soothing pops, Starke entrust listeners with their experience of amiability, character, and spirit, producing "A Letter From Yesterday", which is a just and beautiful, exemplary model of the splendor of everyday life.